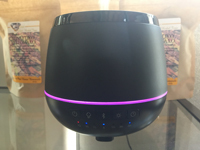 Imagine dispensing essential oil essences easily in your home, office of work space! Put a little Rosemary to help your mind through the day, or Sandalwood to ground and chill out. The possibilities are as endless as the essential oils you choose and the help they offer released into the air with an ultrasonic diffuser. The mist is cold since the diffuser does not create heat, the dispersal is done by frequency!